For expert advice and high quality installations in residential and commercial glazing projects contact the team at Haynes Glass today. Specialising in mirrors, showers, splashbacks, balustrading and commercial heavyweight glazing, from measure through to installation. We view every kiwi home as a special investment warranting attention to detail in all construction elements and finishings. It's more than just glazing to fit a purpose. It's about adding value and glazing for a quality lifestyle. Established in Howick in 1993, Haynes Glass is a full service glass, glazing and glass hardware company. Through innovation, hard work and dedication, Haynes Glass has grown into a glazing company capable of undertaking both small and large scale projects. We are proud to efficiently service the Greater Auckland region. We handle all types of residential glazing for new home builds, renovations and apartments. Our commercial team works exclusively with designers, contractors and architects in storefront, curtain wall systems, canopies, skylights, interior glass partitions and even flooring. Commercial glazing projects require a team with ambition and drive. Armed with both, we are ready for a challenge and excel under a deadline. From brightening your offices to displaying your products through a storefront, glass can make all the difference in showcasing your company. The professional smooth appearance of glass combined with a multitude of practical applications make glass a clear choice. 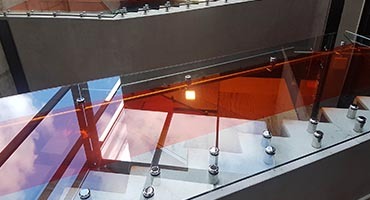 Haynes specialise in shop fronts, internal partitions, glazed canopies, large mirrors and colours and graphics on glass. Our skilful, qualified team have the tools, experience and problem solving ability to get the job done right and delivered on time. As contractors our team prides itself on the relationship with the construction company and or customer, keeping lines of communication clear right throughout the project. Contact us for a measure and quote today. Members of the glass association of New Zealand (GANZ), we take pride in our standard of safety and always glaze in accordance to the latest NZ building codes. We provide producer statements for our projects on request. Our glass paints are eco friendly and we avoid solvents wherever possible.